Asili Dub is a band unlike any other in the East African region. Their blend of African and Asian sounds is an ethnomusicologist’s dream. The band, which consists of three core members – Jamir Adiong, Dread Steppa and Kombo Chokwe Burns – boasts a diverse membership of musical souls from all over the world and has done collaborations with AlaiK, Isaac Anyanga, Idd Aziz, Sophia Chaichee, Vishaka Shah and Ras Lyon. Bad Mambo sat down with Jam, Kombo and Dread Steppa earlier this week, to find out more about the band and what it feels like to be one of the supporting acts at Mungo’s Hi Fi’s premier performance in Africa. What does Asili Dub mean and why? Jam: We wanted a really conscious name because it is dub so Asili means origin in Swahili, so Origin Dub because we’re in Kenya in the Great Rift Valley which is where the origins of mankind lie. We are inspired by the environment in which we find ourselves. Where and why was the band formed? Jam: It started during the second afro asia in 2013. I was starting a project with Dread Steppa and the whole thing was to mix digital and live music. We loved the idea of mixing the indo and the afro side of Nairobi. That’s when we contacted Kombo from Afro Simba. Kombo has a ska/afro/reggae background and had worked with big names on the reggae side. So we decided to explore what would happen if we combined the sounds of Kombo’s music with Indian influences. Dread Steppa: We wanted to incorporate all the aspects of where Nairobi is today. Our music has a lot of Asian influence, Muslim influence and African stuff … we wanted to mix all of that and see what would come out of it. In which genre would you place Asili Dub’s music? How do you combine the various musical influences into the Asili Dub sound? Dread Steppa: We work on the bass first followed by the reggae elements and then we leave Kombo to play on top of these different ideas that we have. Jahm: In the recording studio we really try to capture the first thing that come into Kombo’s head. Sheel: The band revolves around three core members and then other people come in and add stuff. We’re like reggae in that we have the rhythms and the tracks and then get different people to appear on it. Guest appearances are an important part of what we do. 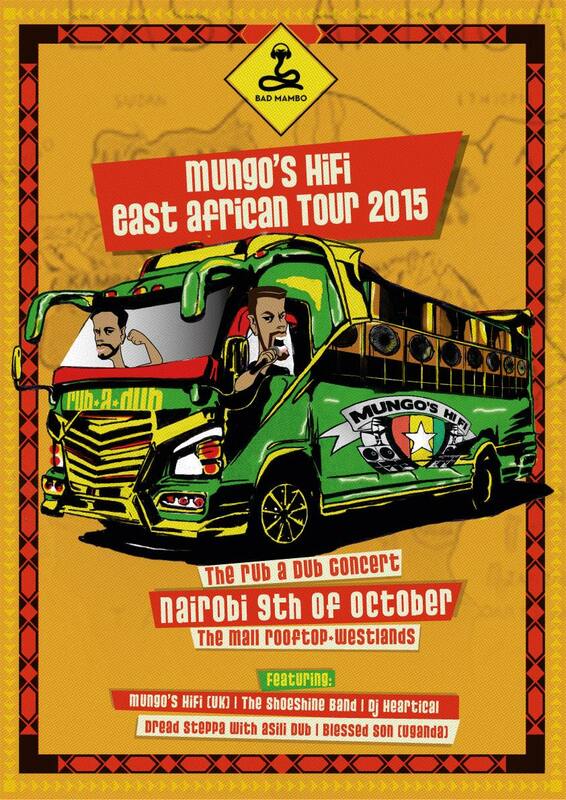 What are your expectations from Mungo’s Hi Fi in Nairobi? Jahm: I’m looking forward to seeing the reactions of the Nairobi crowd when they are put in front of a heavy dub set. Additionally, for us it’s a great opportunity to get our sound out there. Dread Steppa: I am really looking forward to having a heavy crew like Mungo’s HiFi hear our sound… I hope to get lots of feedback feedback from them. Overall though, we expect the concert to be pretty good, the lineup is perfect, the sound system, the location… it’s going to be wicked. Nairobi has been having more and more dub sessions; Think of Selecta Session, Rubadaub, Subterra… the scene has been really growing. This is a good stage to get to a lot of people because Mungo’s are well known and Nairobi has never had a crew like this perform here. People who travel and love music all know Mungos and overall we hope the concert will convert more of our audience to the sound we are currently pushing. What Mungo’s tracks do you recommend guys to listen to? Sheel: Ing and Skidip however there’s way too many. Reblogged this on Nairobi Underground.